Sitting down and meeting with the founding members, it was quickly evident that Discover Rome Area Family Trails (D.R.A.F.T.) volunteers are extremely passionate about their work to develop and promote safe hiking and off-road biking trails for the Town. D.R.A.F.T. was established during a Community Initiative Workshop in June 2015. The Workshop hosted by the Town initiated a conversation amongst the group and united them in a common interest. Less than a month later, the group congregated. Their quest focused around creating outlets for the community to enjoy silent sport activities on safe trails. The group’s name was cleverly concocted by members, Dwight and Jane Gilbert. It originated from the bike racing term, “draft” - a technique where riders bike together in a single file line. Riders in the back take advantage of less headwind, while the front rider receives a slight push from the team. Collaboratively, the bike group is able to conserve energy working together as a team. The name, “D.R.A.F.T.” - Discover Rome Area Family Trails, incorporated all of the important components of the volunteer organization - the location, Rome, the purpose, safe trails for the community to utilize, and the mission, working together to accomplish common goals. A year later in 2016, the group completed their first trail. There was land available in the Alpine Village Business Park, which was once crossed by several old logging, or “tote roads,” as the old timers called them. Using the available property, D.R.A.F.T. volunteers marked the trails, found a volunteer to clear trees, and Town of Rome employees stumped the path and laid gravel. The project successfully created 2.79 miles of trail that wind through the Business Park land and connect the Business Park to Lake Arrowhead area. Linking two hubs of Town without utilizing Alpine Drive, a busy Town Road, the trail made it safe to travel to the town center without having to worry about road traffic. With the support of the Town, D.R.A.F.T. celebrated the opening of the trail with a Ribbon Cutting Ceremony on June 25, 2016. Currently, new hiking and biking trails are being cleared, marked, and signed for the public’s use. “We have a good start of a trail network for hiking along Lake Petenwell, through Sand Valley property, and from the Lake Arrowhead Chalet to Sand Valley,” shares Bob Radder, D.R.A.F.T. volunteer and member of the Rome Town Board. “As development continues in our Community, we look forward to defining and developing these resources to provide additional recreational opportunities for residents and visitors to the area.” D.R.A.F.T. urges those interested to download the app, “Trail Treker,” a useful guide, constantly updated with current trail routes, and the most convenient tool to navigate Rome’s hiking and biking trails. The organization has broadened their work to educate the public about their mission. With a weekly booth at the Rome Farmers Market, D.R.A.F.T. shares information with others and strives to widen their reach within the community. “We love to have volunteers! That’s what keeps us going,” shared Sue and Lowell Lillge - two of D.R.A.F.T.’s founding members and dedicated volunteers at the weekly Farmers Market. The organization continues to garner support for their mission and encourages those interested to participate in their monthly meetings, volunteer to lead guided hiking and biking tours, or donate time to educate others at the Farmers Market. D.R.A.F.T. runs solely on donations and with the help of volunteers. The initiatives accomplished are in direct correlation with ideas gathered from the community. Currently, the organization is collaborating on ideas to link the three lakes in the community safely to the Business Park, a potential plan to safely deal with Hwy 13, as well as creating more recreational trails and opportunities for sand fat tire biking. D.R.A.F.T. 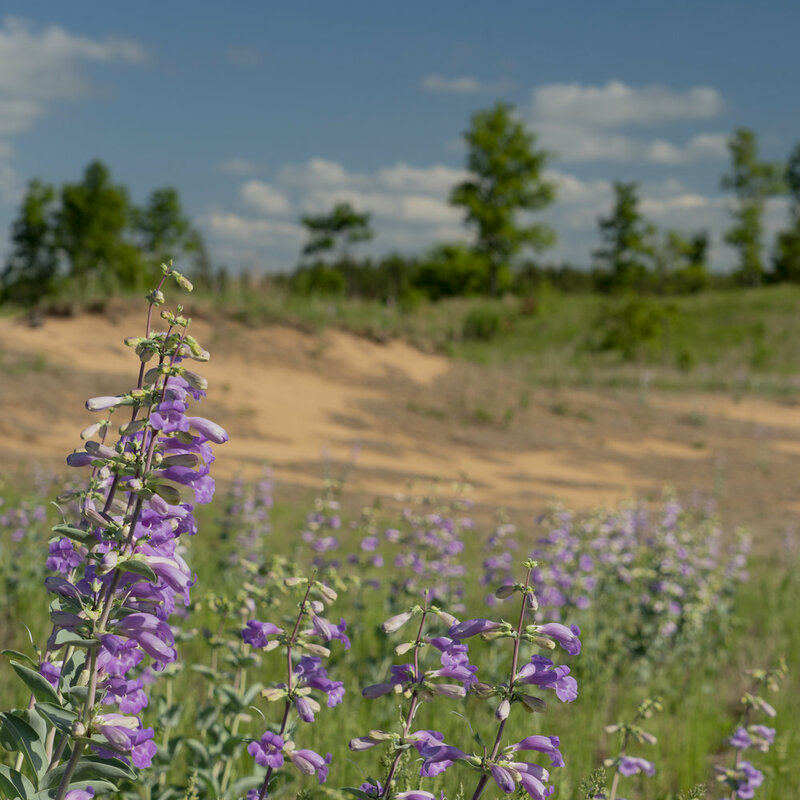 leads Sunday hikes of trails on Sand Valley Property and the Bentley Hills Trail. They also host community events - such as their “Family Bike Rides” through the community on safe routes. With more people in the area and a desire for more recreational opportunities, D.R.A.F.T.’s dedication and hard work are great benefits to the community - a true testament to the fact that individuals passionate about a mission can make a difference in their Town. To get involved or to receive more information, reach out to D.R.A.F.T. via email at draftromewi@gmail.com or follow them on Facebook (@draftromewi) for upcoming events.